Electric container is also called as electric capacitor, two metal electricity polar separated by one isolation electrolyte panel installing into one cylindrical aluminum housing composites a capacitor, it is widely used in electric industry. If you are familiar with electric capacitor, you may find that most of the electric capacitor has a aluminum shell, and aluminum slugs is the raw material for processing electric container shell. Haomei Aluminum is one of the professional aluminum slugs manufacturers who can supply customized shape and size at your choice. Aluminum electric capacitor shell processed from aluminum slugs has many advantages, the coefficient elasticity is small, collision friction can not afford sparks, there is no metal pollution, no toxicity, the surface oxide has no volatile metals. 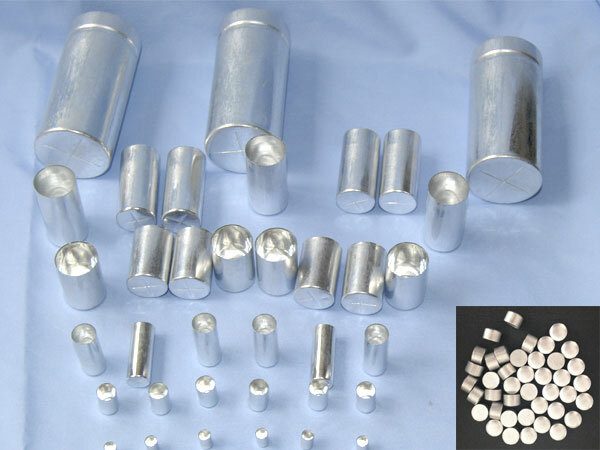 Aluminum has low density and light weight relative to other metal materials, it has good plasticity and good productivity which has a very good advantage for the production. Aluminum electric capacitor shell has hot and cold two kinds of process method, it has strong corrosion resistance, and the aluminum content is very high. Aluminum slugs for electric container has good ductility, can be made of light alloy with a lot of metal elements. Aluminum electric capacitor shell has stable chemical performance, non-magnetic, can be recycled repeatedly, is a benign recyclable metal material.